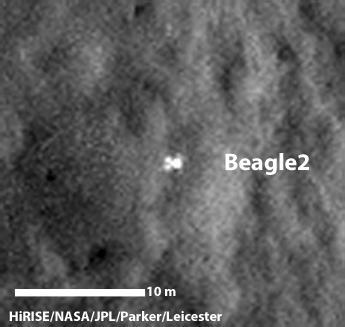 A configuration interpreted as the United Kingdom's Beagle 2 Lander, with solar panels at least partially deployed, is indicated in this composite of two images from the High Resolution Imaging Science Experiment (HiRISE) camera on NASA's Mars Reconnaissance Orbiter. 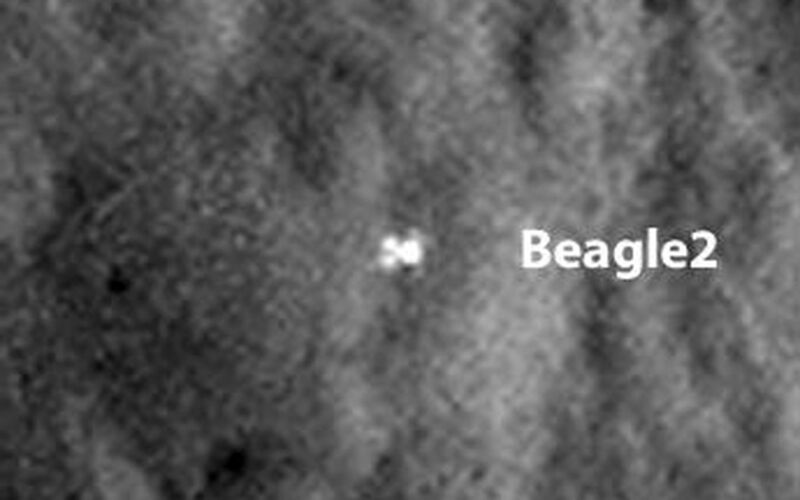 Beagle 2 was released by the European Space Agency's Mars Express orbiter but never heard from after its expected Dec. 25, 2003, landing. 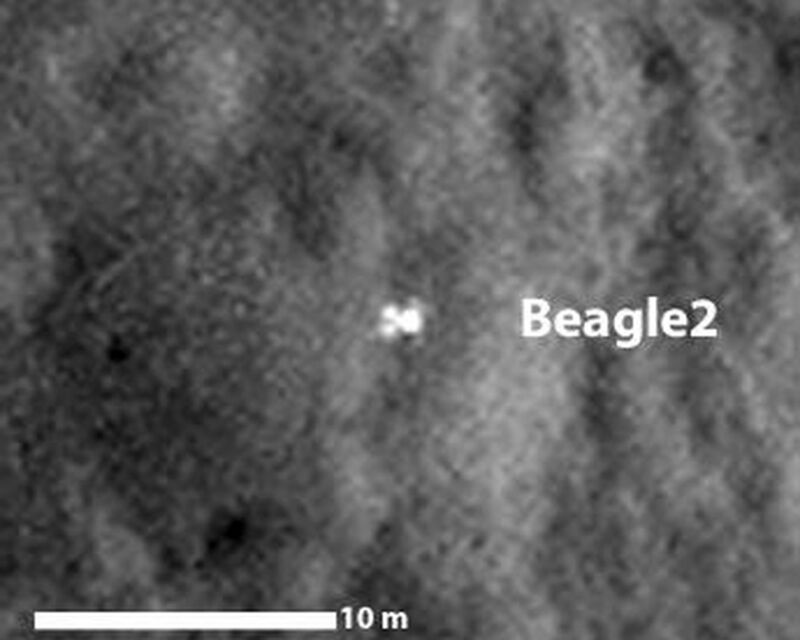 This and other images from the High Resolution Imaging Science Experiment (HiRISE) camera on NASA's Mars Reconnaissance Orbiter have located the lander close to the center of its planned landing area. Two images taken months apart, with the sun at different angles, are merged in this view. 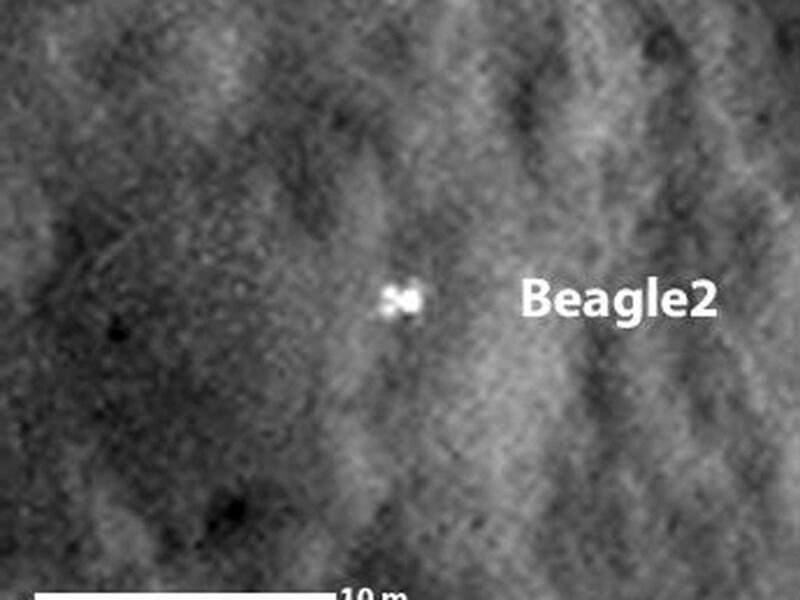 A glint comes from a different part of the lander in one than in the other, interpreted as evidence of more than one deployed panel on the lander. The merged images are excerpts of HiRISE observations ESP_030908_1915, taken on Feb. 28, 2013, and ESP_037145_1915, taken June 29, 2014. Other image products from these observation are available at ESP_030908_1915 and at ESP_037145_1915 . The 10-meter scale bar indicates a dimension of 32.8 feet. The location is approximately 11.5 degrees north latitude, 90.4 degrees east latitude.